During this Dharma Vanishing Era, Holy Ziguang Shang Shi came to this world for the sake of enlightening all sentient beings. Directed by Mahavairocana Buddha, Holy Ziguang Shang Shi founded “Guang Huan Mi Zong” and disseminates the immeasurable Great Perfection Supreme Esoteric Dharma, with great compassion. This allows those with a deep foundation of wisdom to cultivate themselves and attain achievement. It provides an expedient and reliable path to be liberated from the sea of suffering, and enter the Pure Land of the Buddha Worlds. An ancient Buddhist Sutra predicted that during the Dharma Vanishing Era, this world will experience drastic changes. The weather will become unpredictable and epidemics will be widespread. People can no longer control their own lives. If people do not walk on the right path when they are alive, they will eventually enter the evil realms after death. There are many who claim themselves to be monks and nuns but do not behave righteously. By this time, the Exoteric doctrines will be decaying while the unsurpassed Esoteric School will be flourishing. After many eons, the Cosmic Halo will appear, and the renaissance of the Esoteric School will begin. At that time the purple golden light will shine upon the Saha World. According to Sakyamuni Buddha’s prophecy, 2,500 years after the Nirvana of Buddha, there will be a sage, who is capable of imparting three kinds of Supreme Yoga, appearing in a virtuous and gracious place in a western country. This sage will teach Buddhism and disseminate Supreme Dharma, and thus Buddhism will be flourishing in that place and widely spread across the world. In this Saha World, the conditions for disseminating Esoteric Dharma have ripened, providing the opportunity for destined beings to cultivate. 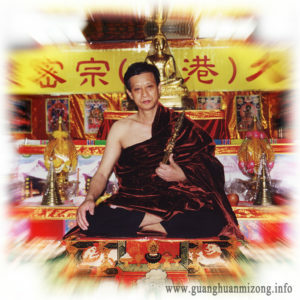 If people are willing to deepen their affinity, make offerings, convert to Guang Huan Mi Zong wholeheartedly, and cultivate Guang Huan Mi Zong Great Perfection Supreme Dharma, they are able to overcome evils, enjoy good fortune and career success, attain wisdom and a profound state of cultivation, and eventually achieve Perfection. In order to enlighten the beings of the Six Realms and extricate them from suffering and illusion, Holy Ziguang Shang Shi, who is compassionate to all sentient beings, descended to this world to preach the invaluable Dharma. The Holy Master observes and teaches the Great Dharani Dharma of inconceivable power and merits, which has been attained by all Buddhas. If people cultivate Guang Huan Mi Zong Dharma in accordance with the right method and dedicate themselves to a great vow, a subtle and profound transformation can be quickly achieved, and Buddhahood can be attained if all their merits are fulfilled.